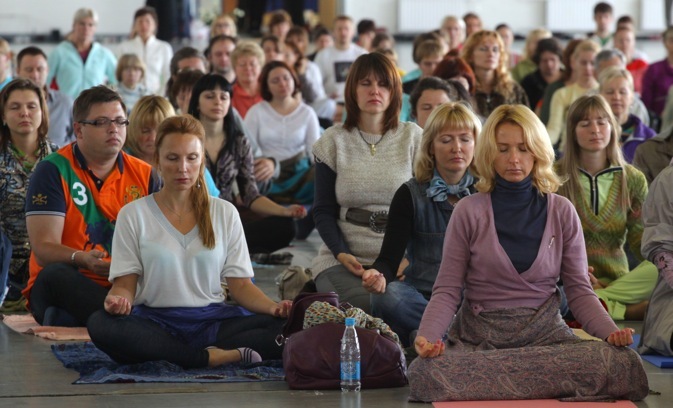 Some Russian certified yoga teachers have become as flexible and professional as Indian masters and look to become spiritual gurus for their compatriots back home. India attracts people from Russia for various reasons including its cultural heritage, natural beauty, beautiful beaches, freedom and lack of rules and last but not least for its spiritual practices. It’s a global trend to come to India to find their one’s inner self. Yoga, ayurveda, meditation are for most people in the Western world the essence of India. In southern India, the Sai Baba ashram is hotspot for those looking to get enlightened and spiritually healed. Then there are Kerala’s ayurvedic centres that provide herbal treatment and cure old diseases through the ancient form of healing. It’s a new trend for Russian girls come to India not only to learn yoga but become certified yoga teachers. This is a great way to make a fortune in Moscow, where a certification from the land of yoga carries a lot of weight. There are some newly certified yoga teachers who have become as flexible and professional as many Indian masters and look to spiritually guide their compatriots back home. I recently met a Russian couple, Igor and Alla in Bangalore, who have been coming to India for several years and have become spiritual teachers for many Russians. They are the part of the movement called “Sahaj Marg” or “Natural Path.” It’s a large global movement supported by the United Nations. The origins of the movement in Russia go back to the days of the Soviet Union. A young Indian student in Minsk started spreading the movement in the USSR in 1987. Sahaj Marg has now grown into a huge practice in Russia with more than 1500 centres spread out all over the country. The major Sahaj Marg centres are in Moscow, St Petersburg, Murmansk, Chelyabinsk and Novocherkassk. The Moscow centre is supported by the Indian Embassy. Like all similar movements, Sahaj Marg in Russia has a developed an organisational structure, with the main leader on top, teachers or gurus in India and other countries and their apprentices. There is an annual seminar held in an ashram in Chennai and this year, 700 people from Russia attended. According to the official website of Sahaj Marg, the essential features of the system are Meditation, Cleaning and Prayer. The “cleaning” of impressions is claimed to be unique to this method. Meditation is on the “mere supposition of divine light” in one's heart and it is done for 30 to 60 minutes every morning. Cleaning is done to remove the accumulated grossness in oneself. It is undertaken in the evening after the day's work is over and lasts for half an hour, while the bed time prayer is 10 minutes. Why are these kinds of self improvement techniques attractive to Russians? To know the answer to this one has to go back to Russian history. For 70 years under the Soviets, religion was forbidden in Russia. People were “made” to lose their spirituality and had to hide their beliefs. After the Soviet Union’s collapse, many Russians were eager to discover the qualities that were submerged for many years. They discovered the inner way of life through religion and other techniques. Movements like Sahaj Marg appeal to people in Russia as they tend to be flexible and open to experimentation. I am happy to see that Russia is changing in its spiritual attitude. It doesn’t matter what religion you practice, what matters is to find your heart and contribute into positive energy of the Universe.